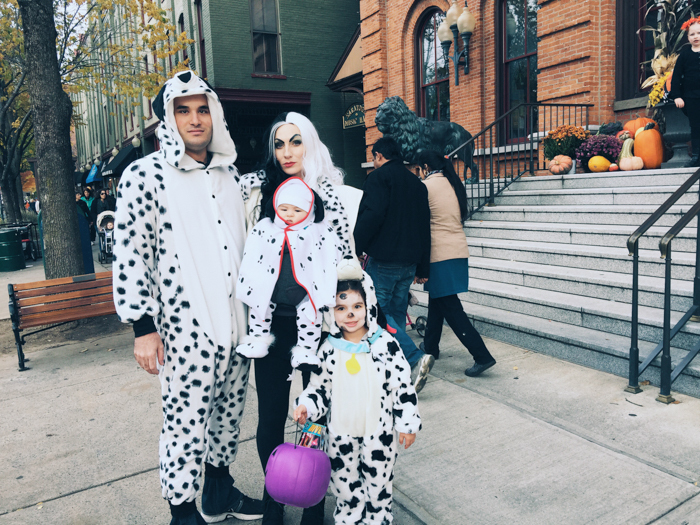 Lauren Rebecca: Halloween 2015: 101 Dalmatians Theme. 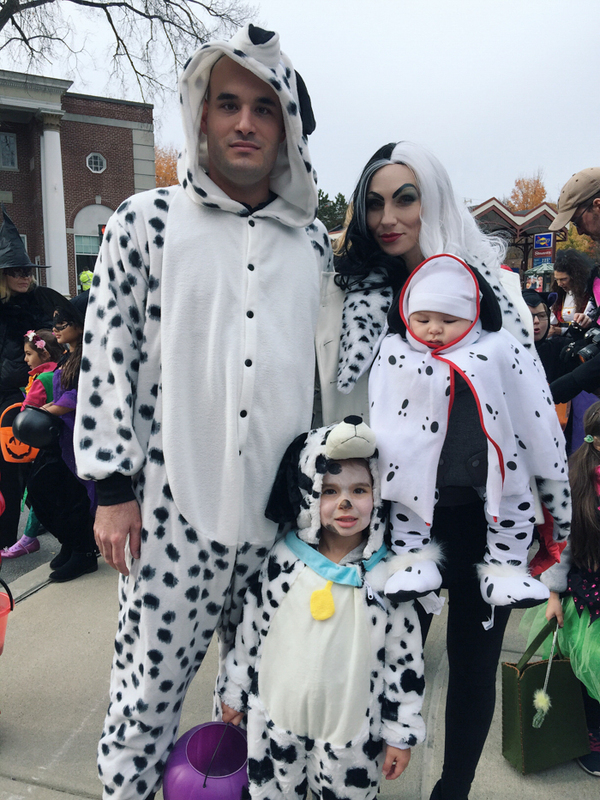 Halloween 2015: 101 Dalmatians Theme. I figured that Scarlett was old enough to choose what she wanted to be for Halloween this year. She figured that she was old enough to know what we all wanted to be for Halloween this year. Last year, I was sick beyond measure with pregnancy all-day sickness. Blah. I didn't enjoy it that much. I decided to be a good sport when Scarlett asked if we could all dress up together. She picked the theme. Lately she has been obsessed with dalmatians. I'm sure it has something to do with the fact that she watched the movie for the first time recently. Her teachers tell me that she gets the entire class to act like dogs and follow her around the classroom. I have no feat that this child will not be a follower, but a leader. 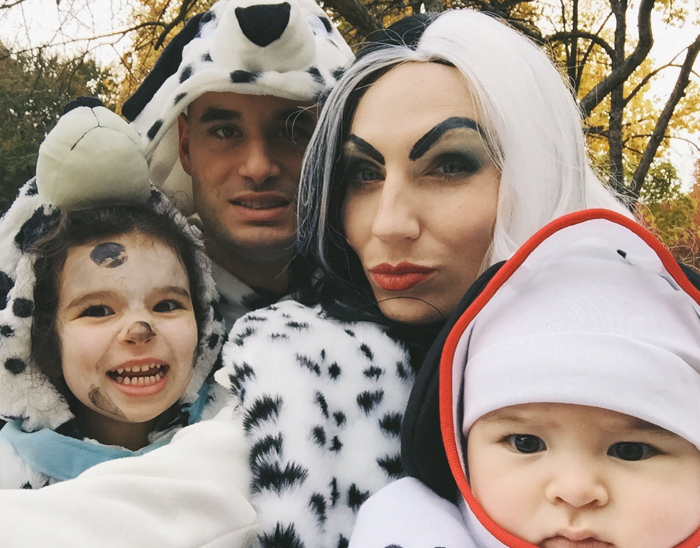 Scarlett said that she wanted to be Perdy, Daddy had to be Pongo, Maxwell should be Lucky and I should be Cruella Deville. Fair enough. I guess I do hold that "mean lady" hat sometimes. Ha ha. So I went online and started searching for costumes. Honestly, this theme didn't cost that much. Here are some of the links to our costumes. My Costume: Wig here, Scarf: Target, Gloves here and the coat was a white coat that I already owned. We had a blast of a time. So much so that I didn't really get many photos. Ty was such a good sport and even wore this crazy dog costume without question. He'll do anything for Scarlett. You make an amazing Cruella De vil!